Hyperkeratosis is an exaggerated form of Keratosis Pilaris (a.k.a. Chicken Skin or dry bumpy skin). If the area has been subjected to a lot of friction and repetitive stress it can build up a harder callus layer. Magnesium chloride and plant fats can help soften, moisturise and protect the skin barrier, helping to return that bumpy and hard skin layer to a more supple and healthy condition. Keratosis can also develop concurrently with inflammatory states such as eczema, psoriasis, dermatitis, allergies and asthma. If the inflammation is adequately quelled, the skin issues also tend to dissipate. Magnesium is a powerful anti-inflammatory. Many studies since last century have confirmed that in low-magnesium states we are more likely to develop inflammatory conditions. Where those inflammatory conditions manifest depends largely on genetics and environmental factors. Some people can experience skin problems or mood swings and depression, while others develop hardening of the arteries or sugar-sensitivity (metabolic syndrome) and unstable energy fluctuations. Multiple symptoms can occur and are usually a sign of magnesium deficiency. Hypercalcaemia (too much calcium) are signs of magnesium deficiency, as magnesium is the counter-balance for calcium. We tend to get a lot of calcium from foods, but much less magnesium these days. In addition, we can lose a lot of magnesium via stress. Calcium causes stiffening and rigidity of muscles, ligaments and blood vessels, making us less flexible. Excess free calcium can also thicken blood plasma like flour can thicken the sauce of your casserole. This leads to hypertension (high blood pressure) because blood becomes less fluid and calcium can also precipitate on the endothelial lining of arteries to harden them, increasing cardiac pressure. Calcium acts like a bully to harden, dry us up and age us faster when not controlled by enough magnesium. If you are only dealing with keratosis or hyperkeratosis so far, then take this symptom as a warning that more magnesium deficiency symptoms may follow over time. The dryness and bumpy or flaky texture of skin indicates that moisture is not being adequately held, collagen structures may be degrading and excess calcium may be moving in to harden tissue. You need plenty of magnesium to synthesise proteins like collagen for structure and elastin for flexibility. When magnesium is low the collagen of skin becomes thinner, weaker and more brittle. Magnesium attracts hydration and helps build structure and smoothness of skin. If you act early to correct the nutritional deficiency, you can maintain equilibrium and good health longer. It’s not just about looking good, but about good health and wellness presenting the most beautiful, well hydrated and best version of you. Keratosis and other dry skin conditions can be triggered by stress and illness. Bad diet, alcohol or drug binging, or inability to digest foods properly (bowel dysbiosis or low stomach acid) also exacerbate magnesium deficiency and keratosis symptoms. Excessive stress inevitably results in inflammation as magnesium reserves drop too low. You will notice that in your personal experience, inflammatory states tend to follow chronic stress conditions or traumatic events: Magnesium becomes depleted and the inflammatory response peaks. Energy reserves are then diverted towards defending the body against pathogens, leaving us feeling fatigued and empty. Nothing in the tank can also lead to depression because the brain is a huge consumer of energy. This is why we naturally feel like sleeping a lot to recover from cold and flu symptoms. Grandma’s chicken and vege broth promotes healing because it’s packed with essential minerals like magnesium and zinc and the wonderful gut-healing properties of gelatin. In addition, soup is easy to digest and absorb, thereby not robbing us of too much energy in digestion. Beneficial bacteria need magnesium too. This gut eco-system helps us to digest food and take care of the lining of the gut where most of the leukocytes of the immune system are produced. If we are low in magnesium our immune defence weakens. This means more leukocytes keep being sent to defend us, but they are less virulent and don’t have sufficient electrical energy to get the job finished to kill the bad bugs! To supply more energy to your immune system support it with adequate magnesium, probiotics and easy-to-digest nutrition. The presence of plant fats help to absorb optimal magnesium ions, as well as hold moisture inside the epidermis. This protects the skin barrier. Magnesium, as part of ATP metabolism, promotes control of excess calcium and repair of tissue cells for healing and recovery. 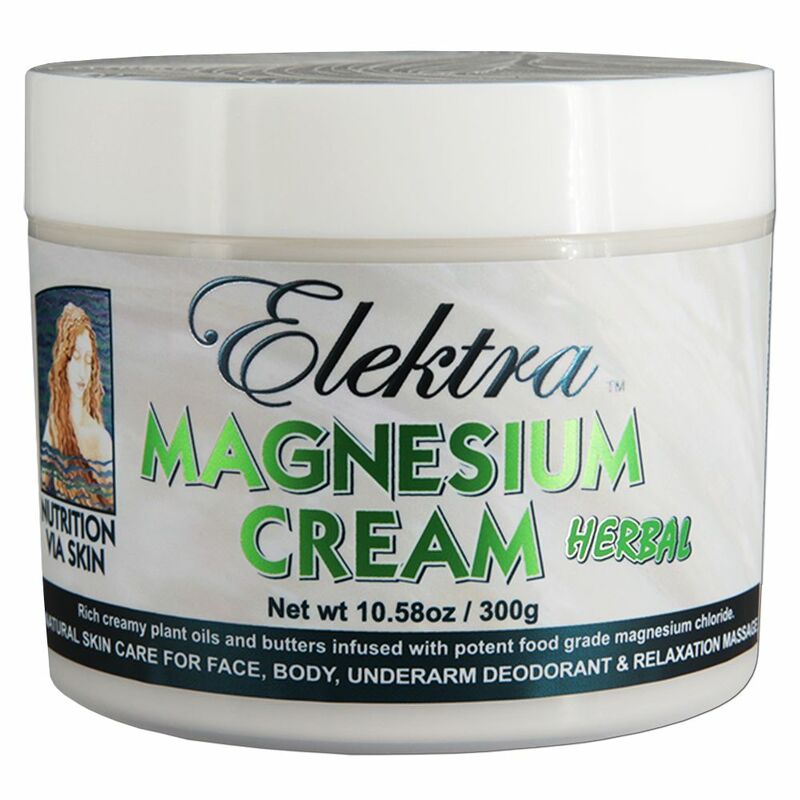 Try Elektra Magnesium Cream daily to support a glowing healthy looking skin with good hydration and elasticity, as well as to soften skin and scar tissue. You can’t use too much. Feed your skin what it needs to recover… Be generous and enjoy fantastic results!